The Tower of London, dating back over 900 years, is known as one of the most haunted places in Britain. In 1078, the first stone section of the tower was built and commissioned by William the Conqueror. It slowly morphed over time with additional structures and towers being added. Like Alcatraz, much human suffering went on within the cold stone walls including executions, imprisonment and torture. It wasn't just reserved for the lowly criminal but for the famous and powerful as well. Social stature mattered not for the Tower of London! 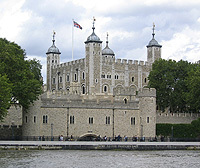 Of the famous that haunt the Tower, there are reports that the headless ghost of Anne Boleyn meanders the eerie corridors of the White Tower. She was one of two wives that were ordered for execution by husband, Henry VIII; the other being Catherine Howard. Anne is also spotted in the Chapel of Saint Peter ad Vincula where she watches over her own grave under the altar. Catherine on the other hand can be heard screaming behind the door of the room she was kept in before her execution. Other famous ghosts are Thomas A. Becket who struck down the Traitor's Gate with a crucifix, witnessed by a priest. People have also seen 12-year-old King Edward V and his 9-year-old brother Richard Duke of York in the Bloody Tower still wearing the white gowns they were imprisoned in. This place has no shortage of ghosts as you can see! These famous rumors intrigued the BBC and they teamed up with paranormal investigators to try and capture some of these ghostly images using special cameras that convert night-time into day and infra-red light, aka "black cameras". They also used temperature gauges, and other devices to prove or disprove some of these haunting claims. Though they could disprove much of what seemed odd about the Tower, there were still 10% of their experiences that baffled them. They also came away with "wonderful" images including unusual orbs of light. They claimed they were much less skeptical after their investigation. The final interesting tidbit about the Tower of London is that there are always ravens present at the Tower. It is legend that if the ravens were ever to leave the tower, England would perish!